Maccabi Electra dominated Besiktas JK Istanbul 101-58 at Nokia Arena in Tel Aviv on Thursday night for its sixth straight victory. The Israeli champs set and tied Top 16 records with a thorough performance in climbing to 8-5 in the Top 16 Group F standings and edging closer to a playoff berth. In fact, Maccabi could find itself in the playoffs by the end of the week, but will need other results to go its way Friday. Maccabi led by 18 after 10 minutes, 34 at halftime and 56 through three quarters in a game that was never in doubt. The final margin of victory, 43, tied for the largest ever in a Top 16 game, first set by Tau Ceramica Vitoria in a 99-56 victory over Lottomatica Roma in 2007. The difference at halftime set a new Top 16 mark for largest lead at the break, which had belonged to Barcelona Regal, which led Fenerbahce Ulker 19-50 earlier this season. Maccabi finished the game with a team performance index rating of 143, which is also the most in Top 16 history, eclipsing the 138 of Vitoria against Milano in 2009. 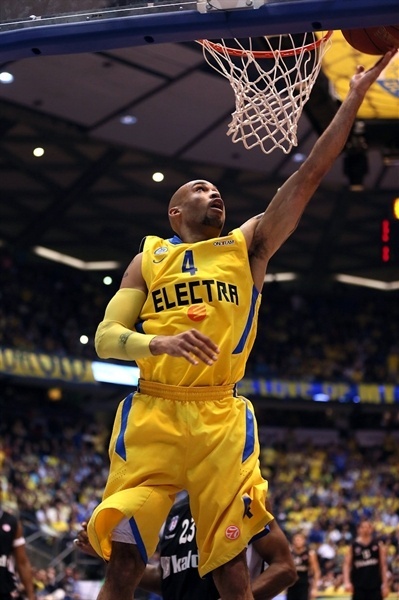 Ricky Hickman and Devin Smith scored 16 points apiece to lead five Maccabi scorers in double figures. Nik Caner-Medley added 15 points, Darko Planinic scored 14 and Sylven Landesberg 10 for the hosts. 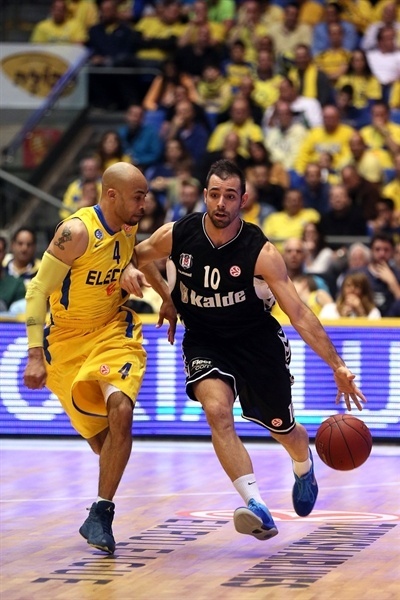 Ricky Minard led Besiktas with 12 points in defeat. Dan Ewing, back after missing several games with a knee injury, sank a jumper to open the scoring. Smith followed with a triple for the hosts. Shawn James followed with a tip-in and despite a bucket from Minard, Caner-Medley heated up. First he sank a three, then a basket inside and after James and Gasper Vidmar traded baskets, Caner-Medley continued his assault on the highlight producers. He grabbed a rebound and finished a fast-break with a layup, which rolled all around the rim and in, and foul. Then a Caner-Medley steal resulted in a high-flying rim-rocking slam that jolted the arena. Soon Yogev Ohayon added a three-pointer and Smith scored on the break to cap a 13-0 run that made it 23-6. Damir Markota ended the Besiktas drought from the line. Smith and Caner-Medley kept the crowd involved with a pair of blocks. Four Hickman points from Hickman sandwiched 2 from Minard to lift the hosts a 29-11 lead after 10 minutes. Serhat Cetin tried to inspire the visitors with the first points of the second quarter, but a Guy Pnini triple kept the Maccabi fans singing. Landesberg took the hosts’ lead past the 20-point mark and all the way to 25 with 6 points in a row. A Caner-Medley three made it 41-13. Cetin hit back from downtown only to see Hickman, Landesberg and James extend the difference to 30+ points. Tutku Acik got involved with a long jumper for the guests. Hickman, Smith and James combined for 7 more Maccabi points. Cemal Nalga split free throws and Patrick Christopher dropped in a three to keep Besiktas afloat. Cevher Ozer added a triple to make it 57-25. Nalga dunked, but a Moran Roth layup left the hosts ahead 61-27 at halftime. Hickman heaved in an off-balance three to beat the 24-second shot clock at the start of the second half to show the magic had not left the hosts. 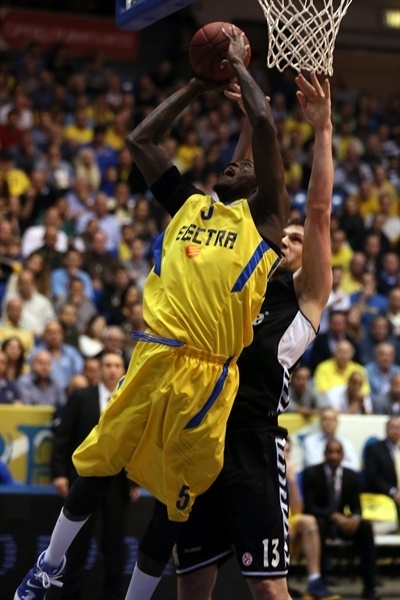 Ohayon created space for a Planinic slam; another Ohayon-to-Planinic move took the lead past 40. 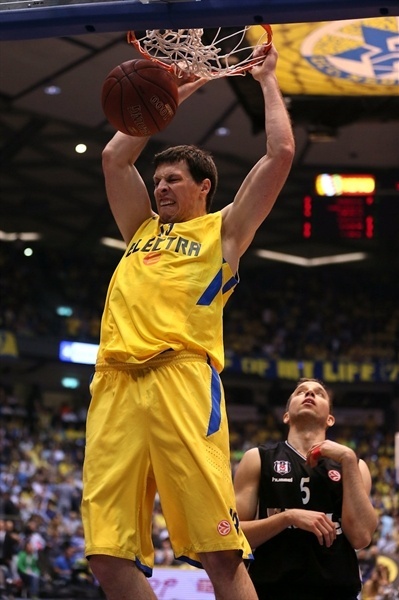 Muratcan Guler sank a triple to end a 9-0 Maccabi run. Vidmar and Minard hit back with baskets, but Maccabi continued to roll as David Logan became the 10th Maccabi player to score. Vidmar remained strong inside, but after a Hickman triple, the lead surpassed 50 points: 86-35. Logan nailed a three on the third quarter buzzer to make it 91-35. Baris Hersek and Minard helped trim the gap a bit and Acik fired in a three. Nalga scored inside to make it 95-45. 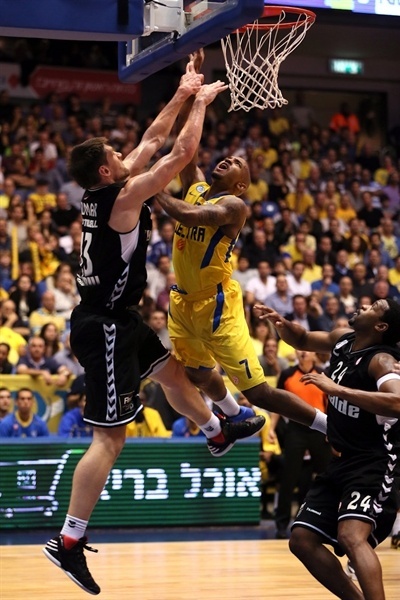 Minard added a slam as Maccabi eased up. 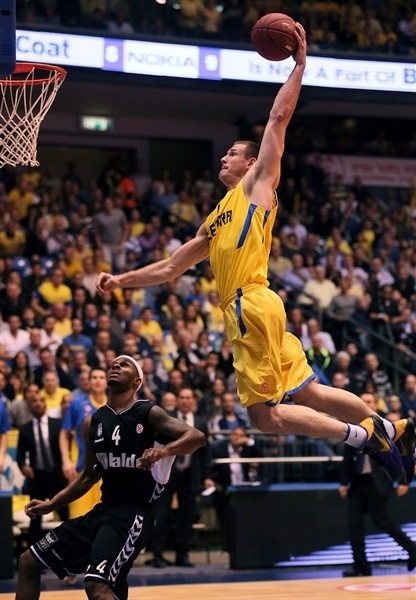 Planinic had the honor of taking Maccabi past the triple-digit mark, 101-53. Even in the closing minutes, the fans had something to cheer for; they hoped to see teenager Itay Segev score his first Euroleague points, but alas time ran out before he got his bucket and everyone left satisfied with an impressive overall performance. "We need to wait until tomorrow before we start talking about home-court advantages. 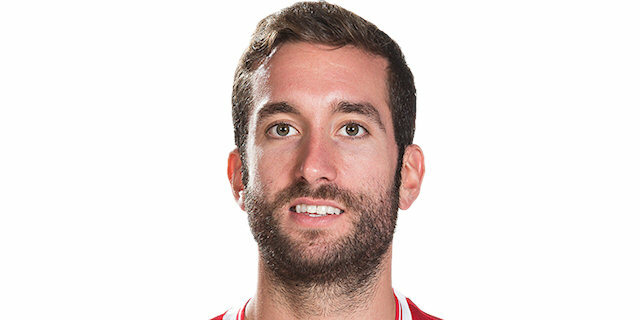 I thought that if we beat Besiktas, we’d advance for sure, but that is far from the truth. I am really pleased with the club and the players that knew how to turn a really difficult situation into a wonderful one. You could see the crowd and the excitement. Since we beat Besiktas the first time, we have won seven of eight games with outstanding basketball. I never thought it would be this easy. 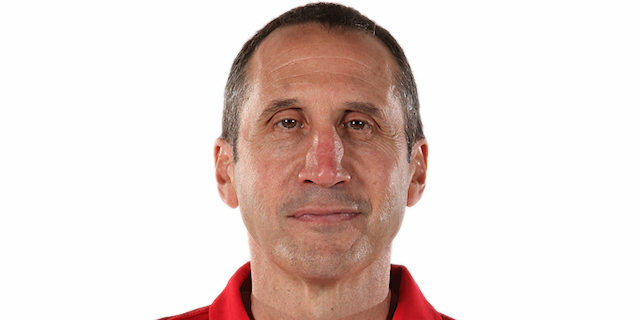 [Assistant coach] Guy Goodes told me ‘We should pay the Turks compensation. After the previous game with Besiktas, [Coach Kunter] said that they played poorly and that we weren’t a strong team. Today we showed that maybe we’re not as strong as in past years, but we’re still strong enough to rout them." "We started to play pretty, attractive basketball. I’m glad it happened at the right time. Tomorrow there are important games and maybe we’ll need to win in Barcelona. We can’t be dependent on anyone; we can beat any team. "